At the hospital, Lois goes to see Catherine and gets scolded by a nurse for asking how Catherine is doing. Kara wakes up, and Alex's friends debate helping her. 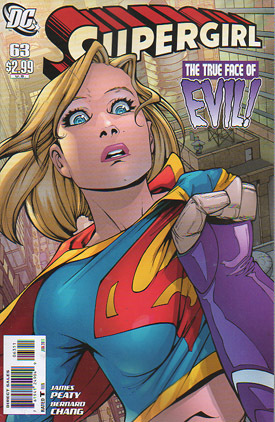 They decide she should learn for herself, and Kara tries to go after Alex and gets knocked out of the sky and Father is back online. Catherine reveals she helped set Alex free from Cadmus. Alex's friends have changed their minds and are now helping Kara, and show her a room with a computer where they woke up. Alex has Blue Beetle and Miss Martian under control, but is having trouble with Robin. Alex forces him to face his worst fears, which include him standing over Batman & Co., all of whom are dead. Catherine tells Lois she helped Alex get free because he promised to cure her son, but not her son. Kara rips a sunstone out of one of the drones. Catherine reveals Alex was grown in a Cadmus lab, raise by the Father program, and she and he developed a bond, and then her eyes start glowing purple revealing that Alex is controlling her. Kara jams the sunstone into her phone and activates the FlyOver app, which somehow deactivates Alex's friends who were really drones. Alex shows up and beats up Kara with the power of his mind, and reveals he's not all Kryptonian but has just a little Kryptonian DNA in him� and the rest of him was cloned from/somehow similar to Dubbilex. Story - 2: We're nearing the end of this arc, and what started off so promising is starting to unravel for me. There were certainly several twists that I never saw coming, but that's because they weren't set up properly and as such come out of nowhere to surprise the audience without the story continuity to back them up. It's either a case of blatantly misdirecting the audience (which is fine as long as the seeds for the twists were dropped in under our noses) or of either the writing or art being too disjointed to truly tell what's going on. I've had that complaint a bit throughout this arc� sometimes what's going on in the pages is obtuse and not at all clear, even after two or three readings. That may be what's causing the problems I'm finding, but either way the problems are there. Let's look at Alex's "friends" as a prime example. When Alex first appears, his friends talk about how he has a way of getting inside their heads and demand to know how he knows so much about them, and Alex even steals one of their girlfriends. But here, in this issue, they're revealed to be his clone robots. If they're his clone robots, why are they asking him how he knows so much about them? How did one get a girlfriend, and why would Alex steal her? It feels like they were revealed to be the clone robots just to shock people in this issue, when that doesn't really jive with how they were presented before. A worse case of the same problem is with Catherine. She gave Lois a file on Cadmus' "Designer Kryptonian". That's actually what it was called in-story. Yet now suddenly he's barely Kryptonian at all, when a big story point was made of it? And if Catherine wanted to come clean and give Lois the info she needed, why would she give her all the info EXCEPT what she tells her here? Why would she have left that out? Well, of course she wouldn't have, so Lois would already know everything she's told here, so it again makes no sense. Even worse is that Alex takes control of Catherine here to� stop her? But why didn't he stop her before she even gave Lois the file in the first place? He clearly knew she did it, he left her that creepy note when her son died about how she should keep her mouth shut. He has the power to control her and read her mind to know what she's telling people, but lets her give his secrets away anyway? Nope, I'm not buying it. In essence it's not the story points themselves that are the problem, it's the execution and lack of proper set-up to make them work. Right now it just feels like we were given an "aha!" to surprise us� well yes, I'm surprised, just as I'd be surprised if on page three Kara ripped off her costume to reveal she's Paris Hilton underneath. But that doesn't mean that surprise would make sense given the context of the story, and that's exactly what we have here. Regardless of reason, the end result is surprise for the sake of surprise without any story coherence or sense, and it's taken a concept I was very excited by three issues ago and turned it into a mess that I lack the desire to decipher. Art - 3: About the same as we've had all along, really. Kara still looks like Paris Hilton a LOT in some panels, not at all in others. The rest of the art is serviceable if not amazing. Cover Art - 4: Nicely done and exciting, though not terribly original. Still a good and interesting image, though, and relevant to the story at hand and intriguing enough to make you curious.